Have you watched the news, TV, or a movie recently? Then you probably have heard someone mention the Dark Web. The Dark Web - What is it and why do I care? Dark Web is a subset of the internet, where as the name implies there is a lot of shady activity. The Dark Web has several purposes, but the main thing to be concerned about is that it is home to many hacker communities and organized crime groups. Almost anything imaginable is for sale on the Dark Web. Of importance to us is that much of the information that has been stolen in the data breaches that you hear about in the news is for sale on the Dark Web. Why do I Care about the Dark Web? The main reason that you should care about the Dark Web is because chances are that your information is for sale by hackers on the Dark Web. Most people have been a victim of a Third Party Data Breach such as Experian, Equifax, Yahoo, or Uber. This information includes things like your name, address, phone number, email address, passwords, security question/answers, social security numbers, credit card numbers, many other personal details. According to many experts and our own research, about 60 to 80% of people have some of their information for sale on the black market by hackers. This black market of information is located in many places on the Dark Web. If your information is on the Dark Web, you are at a much higher risk for being a target for spear phishing attacks, identity theft, ransomware and other really bad stuff that you do not want happening to you. OK, I Care, but What Should I Do? Fill out the form on this page and we will check your email address against the records on the Dark Web and send you a complimentary report of our findings. Depending on what we find, there are several possible actions to take to clean up the security mess. We can help you repair the damage to your personal and business information. We can help you be safe again and stay safe going forward. If you are part of a business, consider a Security Assessment or adding on-going data breach risk scanning to see how vulnerable your network and computers are to losing information to hackers. Also, consider our Dark Web Monitoring Service. This monitors your business or personal information to see if it shows up for sale on the Dark Web. Taking swift action is critical to staying safe. Our service is designed to help organizations detect and mitigate cyber threats that leverage stolen email addresses and passwords. 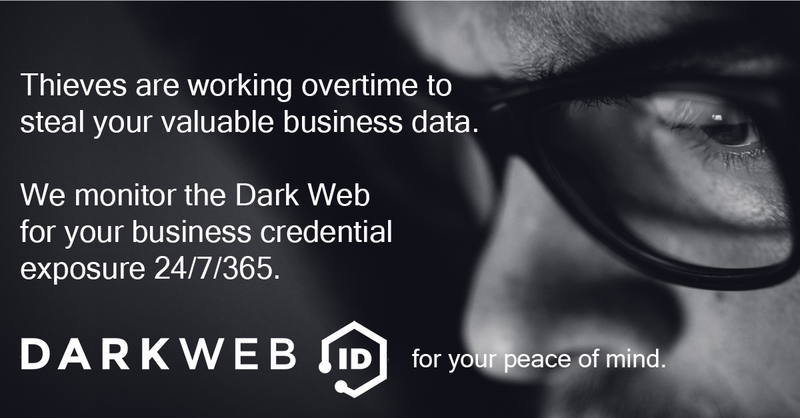 Dark Web ID leverages a combination of human and artificial intelligence that scours botnets, criminal chat rooms, blogs, Websites and bulletin boards, Peer to Peer networks, forums, private networks, and other black-market sites 24/7, 365 days a year to identify stolen credentials and other personally identifiable information (PII).